Clare Walker introduced the 1st Freedom Programme women’s support group to Leicester in 2003 and is delighted to release our start date after the school summer holidays are over, which is 11th September. The running of this group is funded by The Freedom Programme Charitable Trust & Clare Walker Consultancy. We have moved again, so please do give us a call to find out where. 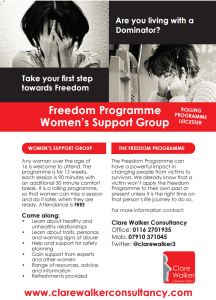 Clare Walker Consultancy is delighted to be able to offer FREE attendance to the Freedom Programme Women’s Support Group to any woman over the age of 16, who can get herself there, from wherever in the world that she lives. We only take self referrals, if you identify a need to attend, then you are welcome too. Just give Clare a call. The venue is city centre based in Leicester and on contacting Clare you will be informed of where that will be. Not sure this is for you? Then why not give us a call for an informal unobtrusive chat and come along anyway, get an education on healthy relationships, early warning signs of a potentially unhealthy relationship – or just come to indulge in the refreshments for couple of hours a week? We already know the powerful impact that Pat Craven’s Freedom Programme can have on a victim’s life, in changing people from victims to survivors. We also already know that a victim won’t apply the Freedom Programme to their own past or present unless it is the right time on that person’s life journey to do so. The impact of not having availability to victims for when that right time arrives can be damming. This can leave victims vulnerable to further abuse or new abuses from a new abusive partner; ultimately they could even end up being the subject of a homicide review or having had children removed. Don’t leave it too long. If you are working with or know of someone you feel is in this situation and they aren’t in immediate danger, please give them our number, so we can invite them to come along. 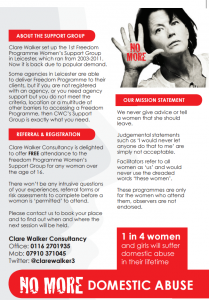 FREEDOM PROGRAMME MISSION STATEMENT: Any woman can call the contact numbers on Pat Craven’s website to be told who to contact in their area where there is a Freedom Programme running. There won’t be any intrusive questions of experiences, referral forms or risk assessments to complete before a woman is ‘permitted’ to attend. All women are actively welcomed to the Freedom Programme. We never give advice or tell a women that she should leave. If it were that easy, she would have already left. Judgemental statements such as ‘I would never let anyone do that to me’ or ‘this has never happened to me’ is simply not acceptable. Facilitators refer to all women as ‘us’ and would never use the dreaded words ‘these women’. These programmes are only for the women who attend them, observers are not endorsed. Every women will be given a copy of Living With The Dominator and the supplement The Freedom Programme Home Study Workbook on arrival to their first session. This is to enhance learning. Clearly she will know if it is safe to take the books home or to leave them with the facilitator.